They say size matters. They also say that everything is bigger in Texas. Well, on the night the biggest differences between Errol Spence and Mikey Garcia were on the scorecards and not on the scales. Spence won a commanding decision 120-108 (twice) and 120-107 and those verdicts, for once, were bang in line with just about everybody else’s. Whichever way you looked at it Spence was the better man. To just say he was the bigger man is simply lazy. In fact, if Spence so chooses, he would likely be a handful at 154lbs, but he might be reticent to try having seen first-hand how that bold but ultimately foolhardy leap backfired on Garcia. The talk beforehand was centred on the size of what Garcia carried between his legs in actively pursuing the fight, and rightly so. In an era when fighters often look for excuses not to fight, he should be applauded for finding the right reasons to target one of the best at 147lbs. He wanted what we all want from our prizefighters, great wins, an A-lister in the opposite corner, to challenge himself and that keyword we hear launched like confetti at a wedding, legacy. But when Garcia said it, we did not condemn it as hollow because he was putting his career where his mouth was. He was putting it on the line. Spence opened as the favourite, of course, but by the time the fight crowd arrived in Dallas more than a few had been swayed by four-division champ Garcia’s bravery and ambition. Spence was good, solid, capable. Garcia was great, or at least he was daring to be. An extraordinary little guy could beat a very good big guy. We heard clichés trotted out, we had heard about De La Hoya-Hopkins, of Leonard-Hagler and of Pacquiao-De La Hoya. Different fighters. Different fights. Different era. A similar plot does not always hold the same ending. Spence wrote his own last night and there was nothing Garcia could do to throw in a twist. It was all he could do to see out the fight given Spence’s dominance. The first was a quiet, scouting round for both but even in the opening exchanges the Dallas man looked snappier. Round two was similar and as he routinely did, Garcia punched the air thinking he had done enough to take it. But not many scoring, if any, were in agreement. In the third there was a first real indicator in the differences of power and strength when Garcia landed a right that scarcely caused Spence to blink. In reply, the Texan landed a big left that made Garcia pivot on the spot. The contest wasn’t catching fire. It wasn’t a fight for the ages. 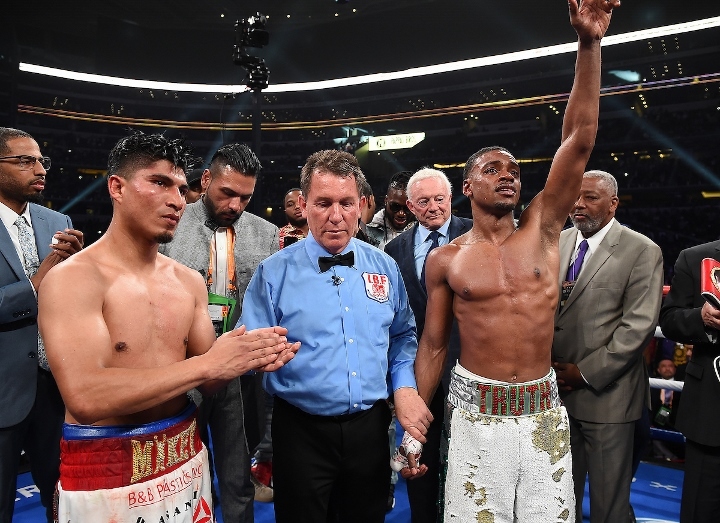 Spence was outlanding and outfighting Garcia, who understandably was timid with his deliveries in case one of them was returned with interest by the career 147-pounder. Spence was timing occasional heavy lefts but Garcia, ever classy and competent, fired back a salvo to close the fourth that indicated he might well oblige Spence in the trenches. The normally flighty and immaculate Garcia was looking a little flat-footed in round five and Spence landed the best shot of the fight up to that point with an underhand rear left that ripped into Mikey’s chops. By now, Spence had begun working the body too, slowing an increasingly static Garcia. Errol was more multi-dimensional and well-rounded than the critics or detractors had believed. There had been some underdog flutters on the bold challenger beforehand, to the point where it was fashionable to pick Garcia. Perhaps that was highlighting an inability to look beyond the obvious while displaying a myopic admiration for Garcia’s own qualities. Regardless, with blood seeping from the challenger’s nose in round eight, it was becoming almost impossible to see how he would get a foothold either in the fight or on the scorecards. Yet still Garcia waved his fist in the air when the bell sounded to mark the end of the round. It was by now more in defiance and hope than victory and expectation. “Walk him down now,” Spence was instructed in the corner. And he followed those orders during a merciless ninth. Garcia’s features were becoming puffy and it was abundantly clear that he had bitten off more than he could chew. The weight was always said to be the determining factor but even if both fighters were 140lbs you would be hard pushed to make a case for Garcia beating Spence. To say the champion won courtesy of his size is to ignore his speed, timing, distance, strategy, shot selection and skills. It’s to detract from him as a fighter, which should not be done. Spence belongs at the top end of your pound for pound lists. “You want to continue,” Mikey was asked in the corner after the tenth. It was one-way traffic, a slow-paced beatdown that grew more relentless and gruelling as the contest wore on. Anyone could have been excused for stopping it, Garcia, his corner or referee John Schorle. He was barely throwing enough to stay in the fight, let alone win rounds. He had accepted his fate. He seemed to understand that there was no one-punch lottery hit and that he just had to cover up and brace himself to get through the waves of Spence attacks that came his way. Body-head. Body-head. Lefts and rights. Spence was unmarked, boxing with a nonchalant swagger, digging in hooks to the torso with both hands and swinging shots laced with spite and malice. Garcia ended up showing his heart, perhaps too much, but that’s what got him in this bind to begin with. The hope is that he can be as good as he ever was at lightweight and that this has not taken too much out of him, but in this, the hardest sport, there are no guarantees that after one heavy loss you can ever be the same again, physically or psychologically. The worry is that those qualities are diminished but the bravery remains, and that’s when a fighter is in trouble. Spence put Manny Pacquiao in his immediate sights after the fight and Pacquiao, now aged 40, is certainly not what he was perhaps physically or psychologically but he is still a brave man. And that spells danger for the Filipino legend.